Your resume is your first chance to make a good impression on employers, so you want to do a great job in making it stand out. 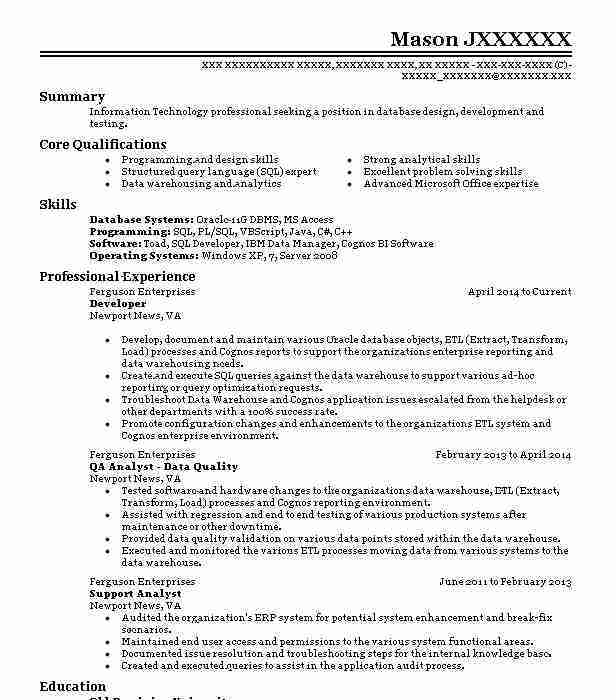 Before applying for your first job in the IT industry or furthering your career in program development, you may benefit from taking a glance at a range of developer resume samples. By looking at other examples, you’ll see how software developers express their skills versus systems engineers, and you’ll also get some insight into the format to use and the information to include. As you continue reading, you’ll find advice on crafting your resume as well as suggestions on what to highlight and what to omit. Developers often have a range of skills that fall across software, systems and web design disciplines. Such a vast and varied knowledge base can make it difficult to figure out what to include in a resume, but even with a massive amount of talents, you’ll want to focus most on the capabilities and experiences that qualify you for the position you’re applying for. Not to mention, whether you are aiming for utilizing your programming language skills or expanding your creativity with app development, your resume should include the following sections. The order of these sections will vary depending on your choice of format. The chronological resume lists items starting with the most recent. Developers with established careers and tons of work experience do well with this format type. If you are a recent graduate or have only done IT development as a hobby, you might be better served using a functional resume. This type focuses on your core qualifications rather than your professional work experience. Take a look at a variety of developer resume samples written in both formats to decide which one will work best for your level of experience. While you may have been taught otherwise, the objective statement is a thing of the past. Nowadays, employers are looking for a brief summary statement that encapsulates and sells your core qualifications. 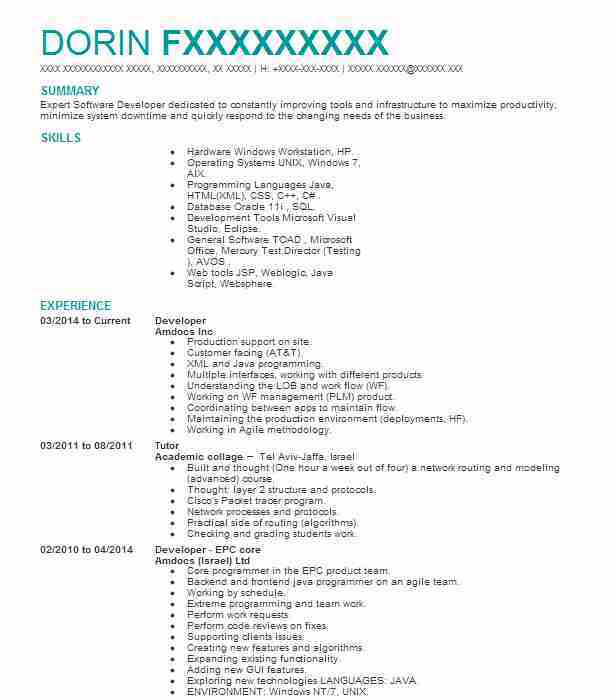 Take a look at other developer resume samples, and you will see that many of them begin with a few sentences describing the applicant’s experience, skills and personality. If you can highlight all three pieces of information in approximately four to six lines, you’ll be golden. The summary statement should not be written out as a full paragraph. Instead, use concise sentence fragments to get your points across. Employers like to read through resumes quickly, so they might skim through a full-blown paragraph and miss your key points that you wanted to emphasize. If you find yourself struggling to condense a career’s worth of experience into three or four brief statements, look over some developer resume samples. Remember that the summary statement is primarily used to point out your most important qualifications that pertain to the job you are applying for. The following examples should also help you get started. Creative mobile application developer with over five years of experience across both Android and iOS devices. Experienced in complete mobile development life cycle, including implementing resolutions and patching updates. Dedicated to learning, evaluating and applying new technologies in order to enhance content and functionality. Accomplished Java developer with full comprehension of all Java packages. Experienced in working on multiple operating systems, including Windows, Unix, Mac OSX and Linux. Flexible work environment with ability to produce under minimal supervision and as a valuable contributor to a team. Under the education section, you should list your degrees, starting with the most recent one. Most developer jobs require a bachelor’s degree as the minimum, so there is no need to list your high school education. You will want to include the name of the school and the degree that you earned. It is up to you if you want to add the graduation date, but you can leave that out if it has been many years since you finished school. Go ahead and indicate any schooling that is still in progression. For example, you would write that you are currently enrolled in courses toward your master’s degree even if you have not completed it yet. Recent graduates can expand their education section to boost their chances if they have limited job experience. This approach is often used when creating functional resumes. You can include certain courses you completed that pertain to the job you want, such as C++ training or web development classes. Be sure to include internships you have done or volunteer work that is relevant to IT development. Lastly, include developer certifications that you have here. Check out a variety of developer resume samples to see how other professionals list their certifications. Indicate if you are certified in particular platforms or have any programming language certifications. Where you place the work experience section will different depending on the type of format you choose. The work experience section will directly follow the summary statement in a chronological resume. Create easy-to-read headlines that include your position, the company name and location, and the dates of your employment. Underneath each job headline, include three to six bullet points that highlight a combination of your responsibilities and accomplishments. Quantify this information if you are able to since numerical data gives hiring managers a better idea of your experience. Reference several developer resume samples to get an idea of achievements and information to include. If you are a recent graduate or have done a lot of freelance contract work as a developer, you may have chosen the functional resume. In this case, you might want to place an Accomplishments or Qualifications section beneath the summary statement. List projects, achievements and other relevant work that is most applicable to the job at hand. If you have both employment experience and contract projects under your belt, you might want to combine the two resume formats. 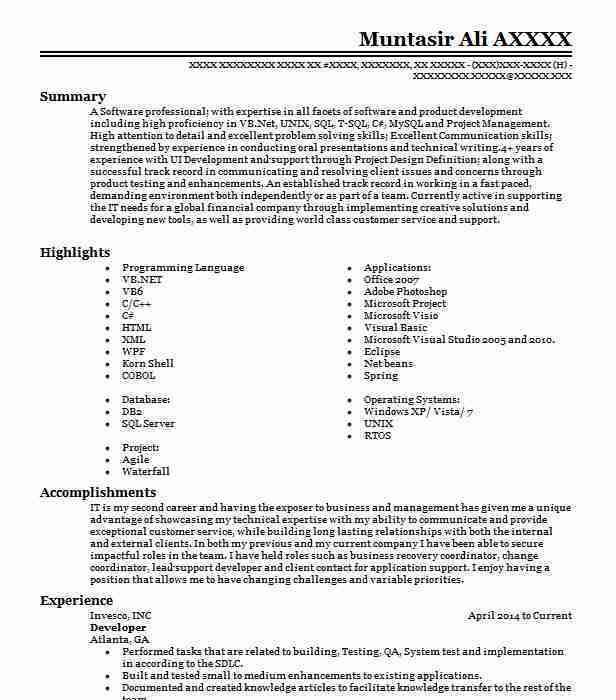 Reviewing multiple developer resume samples written in both types will help you craft your ideal document. Action verbs are what set your resume apart from other developers with similar qualifications. Use the following action verbs to gain inspiration, and use developer resume samples to come up with more ideas. The skills section is where you can really showcase your talents even if they were gained outside of education or work experience. As many developers possess a range of skills, you should start with ones that are featured in the job description. This order lets the potential employer know that you are indeed qualified for the position. The next skills you list will highlight the additional value you can add to the team. Take notice of the skills listed in various developer resume samples, and consider the following examples that may relate to your field. For developers, the skills section is highly important for listing tools, languages, systems and networks that you use or have extensive knowledge of. Depending on your experience, you may want to list applications, software or systems that you have developed or been involved with. Experienced professionals with years of experience may consider creating an online portfolio that features their most prominent projects to save space on the resume. Since many developers submit their resumes electronically, it is easy to add a single link to an online portfolio. In most industries, hobbies are kept to a minimum or omitted completely from resumes. However, a great number of developers choose this career path based on their enjoyment of programming and computers in general. If your hobbies specifically relate to developing mobile apps, creating Flash video games or similar interests, then go ahead and share your downtime experience with the hiring manager. Your overall love for the field will show the company that you are looking for more than just a job. It will demonstrate that IT development is an integrated part of your life and that you are a dedicated worker. Whether you add these hobbies to the skills section or create a new section for these talents is up to you. 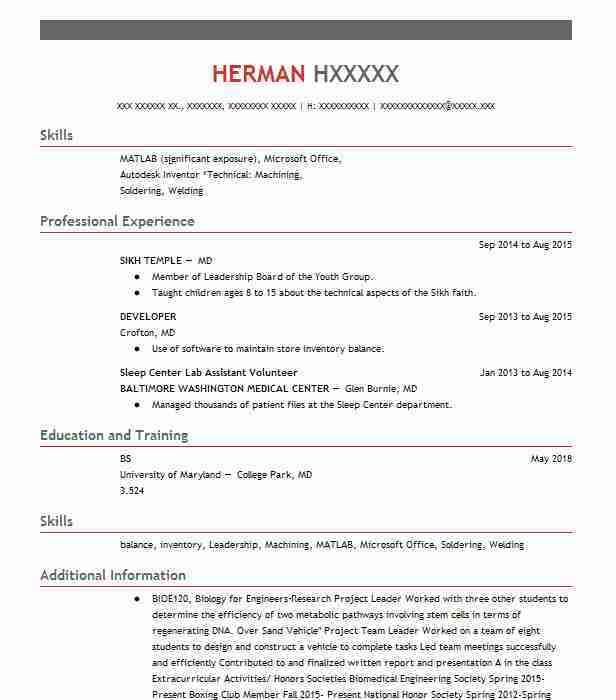 Follow the lead of other developer resume samples to see how some professionals include their computer-related interests. Your resume is designed to represent your professional abilities and highlight your unique qualifications. With that being said, references do not exactly enhance your skills, education or experience, so they should not appear on this document. Interested employers will request references later when taking you to the next step in the hiring process. The most common references used are previous supervisors, managers or coworkers. If you are entry level and haven’t accumulated many professional relationships, there are other options. You might have professors from school that could talk to a potential employer about your developer skills. Friends are okay to use if you collaborated on a computer-related hobby, such as video game design or app development. Whenever you have the option, it is best to start strong with a professional reference. Avoid using too much flair on your resume. 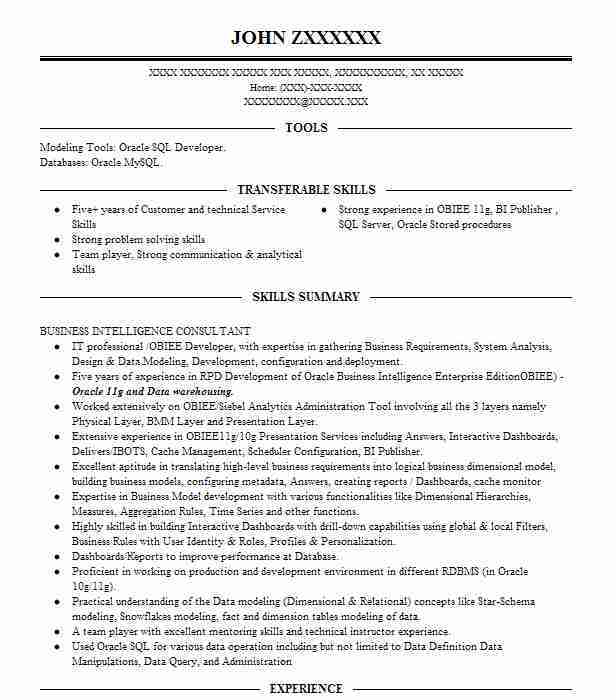 Some developers try to demonstrate their skills by creating elaborate resumes that are flashy or complex. Remember that hiring managers don’t have time to go through resumes with embedded links and fancy graphics. Keep it simple, concise and professional. Do not submit resumes with any typographical or formatting errors. Developers are likely to catch these mistakes and assume that you are not skilled with basic programs like word processors. Resumes with errors don’t say much about your attention to detail or dedication to your career. Entry-level resumes should be kept to one page, and experienced developers shouldn’t have more than three pages. Even if you could list skills and previous projects for days, try to limit it to your most recent and most relevant qualifications. Avoid using first-person pronouns on your resume. This document should be kept formal and professional. It is okay to use “I,” “we” and “my” on your cover letter, but the resume should feature short, concise statements. As the world is integrating more and more technology into businesses and daily lives, job prospects for developers are looking good. According to the Bureau of Labor Statistics, software and systems developers can expect job opportunities to grow by 22 percent, which is double the average of all other industries. Web developers will also see an impressive increase of 20 percent between 2012 and 2022. There has been an increasing demand for computer software for quite awhile, and the advancement of mobile technology creates job opportunities for application developers. The healthcare industry is also starting to hire systems developers as it integrates computer systems into its practices. Businesses are worrying more about cyber threats, which elicit demand for security software developers. Product manufacturers are also in need of systems developers as household items like appliances are becoming computerized. People are also spending more time online to conduct business, shop for goods and relax in their downtime. The expansion of ecommerce increases the demand for talented web developers. Online access using mobile devices is growing as well, leading to a higher need for developers who can convert traditional websites into mobile sites. Some developers are concerned that these jobs are outsourced to lower paying countries, but in fact, most businesses are trying to hire within the United States. Areas with lower minimum wages will experience several developer job opportunities over the next 10 years.